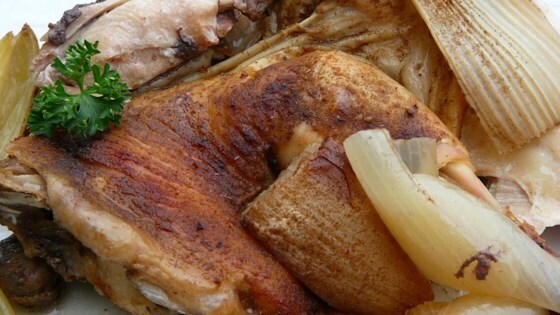 "Celery, onion and a splash of red wine add subtle flavor to herb rubbed chicken. It's juicy and moist; simple goodness." Preheat an oven to 250 degrees F (120 degrees C). Combine the paprika, black pepper, garlic salt, parsley, and marjoram in a small bowl. Pour the red wine into a roasting pan with lid; set aside. Place the celery and quartered onions into the cavity of the chicken. Rub the chicken with the reserved spice mixture, and set into the roasting pan. Cover, and bake the chicken in the preheated oven until no longer pink at the bone and the juices run clear, 4 to 5 hours. An instant-read thermometer inserted into the thickest part of the thigh, near the bone should read 180 degrees F (82 degrees C). Remove the chicken from the pan, cover with a doubled sheet of aluminum foil, and allow to rest in a warm area for 10 minutes before serving. Unbelievable how this chicken fell off the bone. Very moist and flavorful! Absolutely Delicious! The aroma while this is baking is so wonderful. Thank You for sharing such a great recipe Frack Family!